OK, so I didn’t stray from Giada too long :) This recipe was fantastic, aside from the meat being $10, but then again, you get what you pay for. Recipe. 2 teaspoons cumin seeds Note: I used about 2 tsp of ground cumin. 2 teaspoons coriander seeds Note: Omitted (didn’t have any). 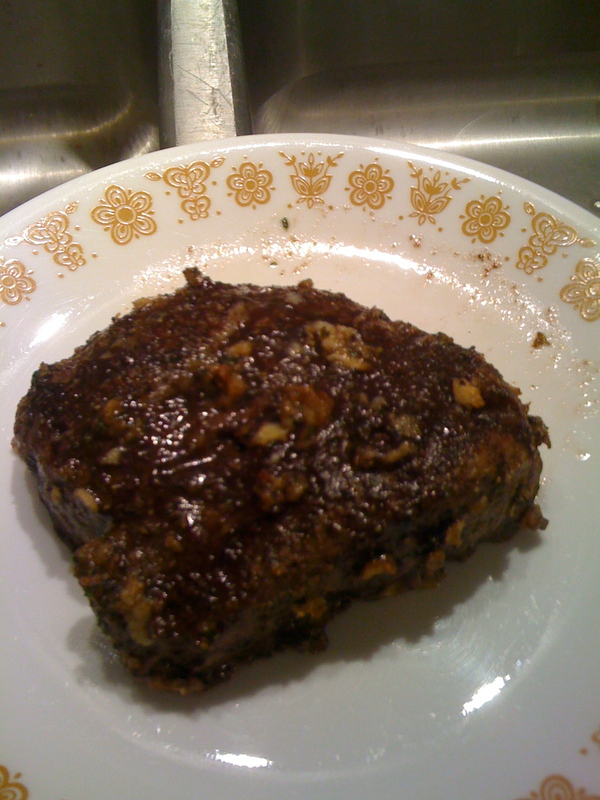 1 (3½ to 4-pound) beef tenderloin, trimmed Note: I used two thick tenderloin steaks. Note: I added garlic powder and added a little more cumin to replace the coriander. 1 cup mayonnaise Note: I used fat free and light. 1/3 cup finely chopped fresh basil leaves Note: Used dried, and not nearly that much, but a couple tbsp. Giada starts the recipe off by having you grind up your own seeds with a mortar and pestle and then toasting them. I didn’t do any of that :) I thought about toasting the ground spices but thought that it probably wouldn’t turn out so hot and decided against it. 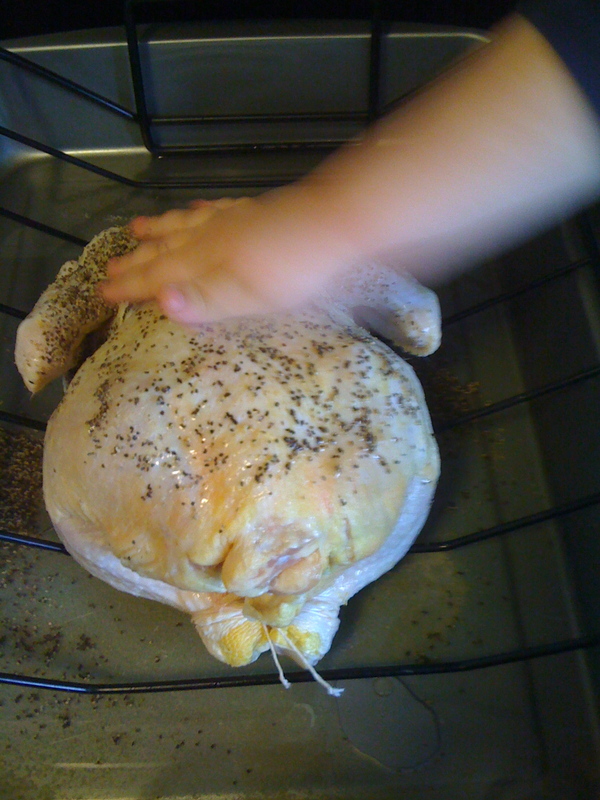 She then has you make the garlic paste, which seemed like it wasn’t going to work at first, but stick with it. You really do just take a large knife and kind of mush the garlic at an angel. I didn’t achieve so much a paste as I did a smushed up version of minced garlic. That’s my version of chef jargon; I’m writing a book on it later. But not really :) After making your paste, just rub it+the spice mixture onto the meat. This is another good opportunity to include your kids! 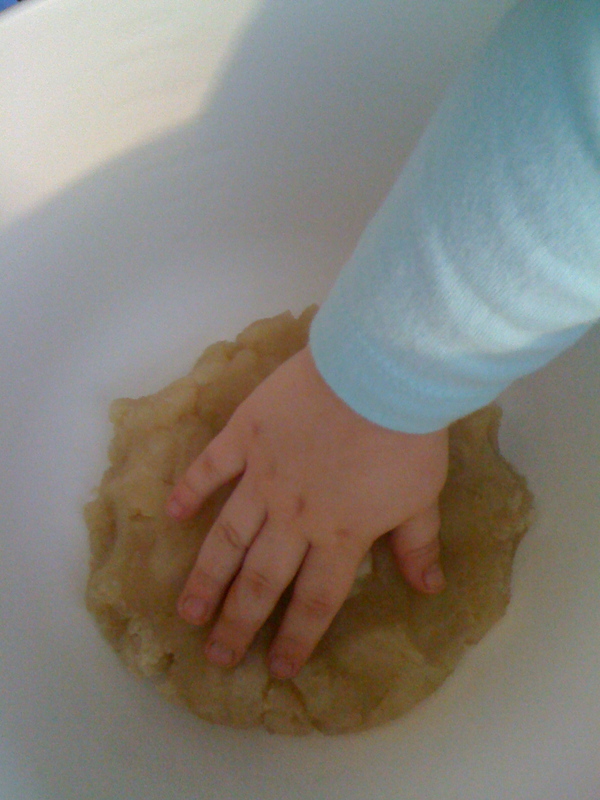 I usually tell A that she can’t touch raw meat because it’s dangerous and has germs on it that can make her sick and we all know kids really enjoy doing things that are usually not allowed, so let ’em help you :) We only put the mixture on one side. The directions didn’t say either way, but one side worked fine for me. I cooked my steaks according to the directions and used a meat thermometer to determine doneness. They were definitely a nice medium between 30-40 minutes, but I turned the oven off and let them sit in there because the husband wasn’t home yet, and that brought them up to medium-well (boo!). This kind of meat is meant to be eaten at medium doneness! Just try it if you’re a diehard well-done kind of person. Well-done just means you have to chew more because the meat is tougher, at least in my opinion and since this is my blog, that’s the only one that matters! :p Juuuuust kidding! 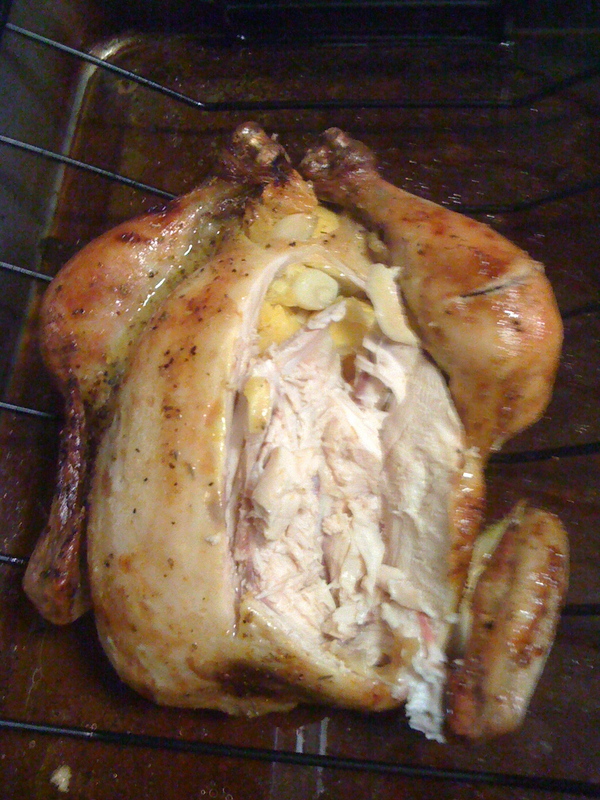 Make sure you let your meat ‘rest.’ Don’t pull it out of the oven and start cutting it right away or else all the juices just spill out. Give it five or ten minutes to allow the juices to reabsorb back into the meat so that they can be absorbed into your belly when you eat them! :) It turned out great. I would’ve like it a little more medium, but I know how to do that next time. Husband rating:9! C really enjoyed this dish and it was really easy to make. If you enjoyed this, check out the Fondant Flyboat Cake, Giada’s Beef Tenderloin, and Giada’s Zeppole. Surprise! Another Giada recipe! I can’t help it. I watch her once a day M-F so most of my ideas are bound to come from her. Who do you guys like? Any requests? I’m up for most anything as long as I don’t have to buy wildly expensive or rare ingredients and my family might eat it :) I don’t know what made me choose these scones. It’s not like I’m a big scone lover or anything. I’m not even that big of a fan of rosemary. I’ve only had that on my grandmother’s lamb really. I do have a baby shower coming up and thought these might be nice to take, but other than that, this was a total random thing. Lie. 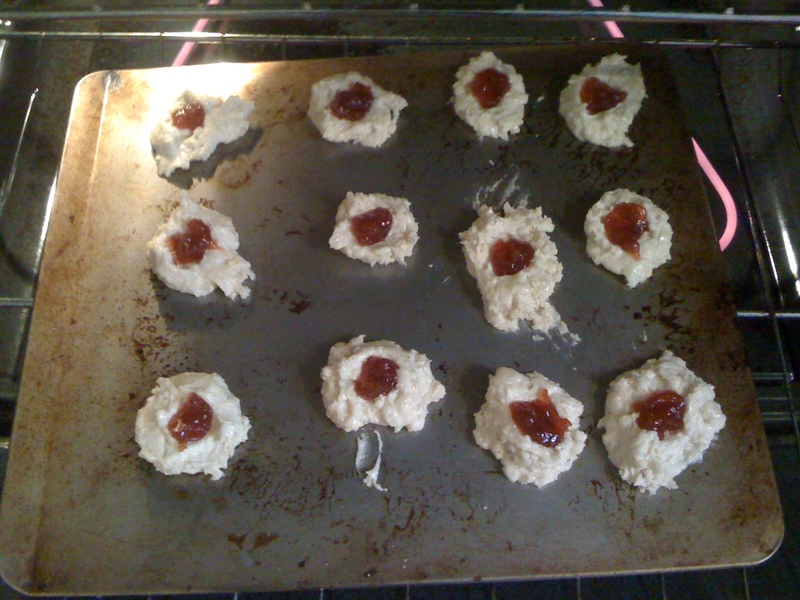 Oops, I also really like A’s (my daughter) strawberry jelly with no sugar added (This stuff is great.). Anyhow, no special reason this recipe was chosen. Note to self: Read the ENTIRE recipe before you decide to make it! I’ve been off my game a little (first with the Zeppole, then this!) and it’s made for some ‘just ok’ recipes, but due to my own mistakes, not the recipes themselves. This one was kind of the same way. The original recipe can be found here. 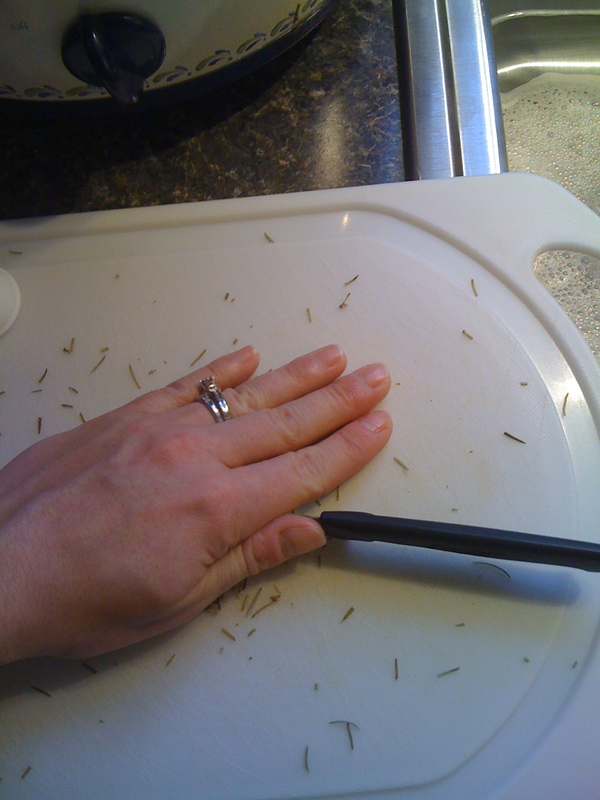 1 tablespoon finely chopped fresh rosemary leaves Note: I used dried. 1 cup heavy cream Note: I only had light cream AND I goofed and used more than called for. ¼ cup fresh lemon juice, from 1 large lemon Note: I used un-fresh. Just place one hand over the top of the blade and press down on the hand with handle with the opposite hand. So, painfully long and embarrassing story short, I blended the ingredients and the dough ended up very goopy and gloppy (probably also because I added more cream because my blender wasn’t blending so well hah :)), but I was reeeallly excited for this recipe, so I just placed them on a cookie sheet like I would chocolate chip cookies :) I pressed down a little in the middle and added about a ½ tbsp of jelly. I made the glaze while the Scoonies were baking and it made way more than enough, for me. Like &frac12; a cereal bowl full of glaze. Would I make this for someone else? : Yes! 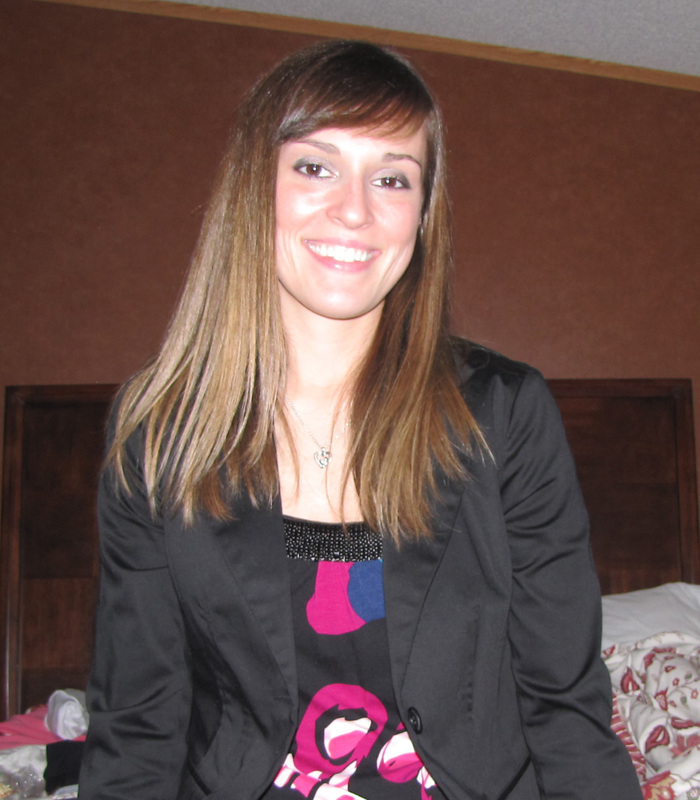 After a few minor tweaks…lol. It’d be nice if they could be heart-shaped like Giada’s. Don’t mind the train wreck that is the video, thank goodness Giada was staying on task because I needed to see this made again and Hoda and Kathy Lee were really trying to ruin it for me! 1 cup (8 ounces) bittersweet chocolate chips Note: I only had semisweet. No problemo. It was little overwhelming with all the separate components, but start the oil heating first. Get the butter, sugar and water mixture going. Make the sugar. Get out the eggs. Get the flour measured out. 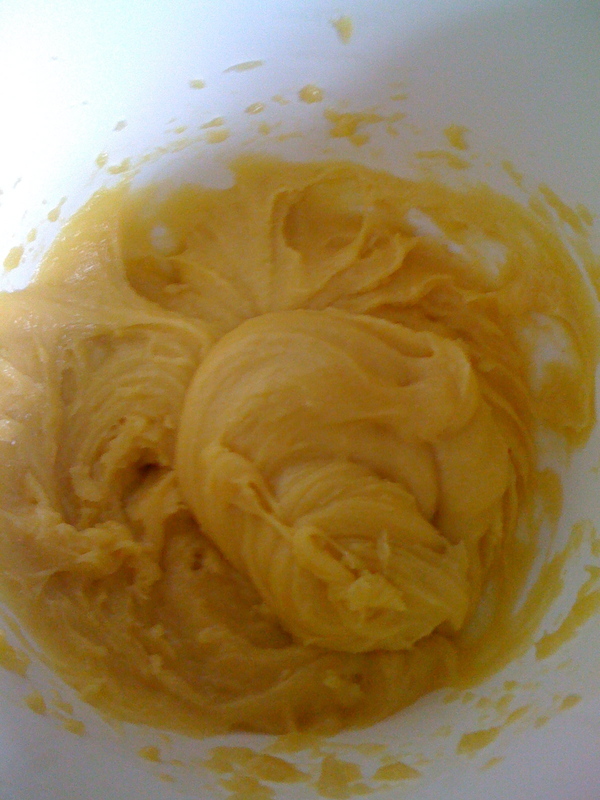 Make the sauce last (I put my cream in the same pot my butter mixture melted in to cut down on dishes :)). It was really easy to make once you got everything prepped. After I added the flour to the butter mixture it formed a ball almost immediately, but I still let it cook for a few minutes, stirring every once in a while, to make sure the flour taste cooked out. This is where things got a bit dicey. As I mentioned before, I don’t have an ice cream scoop, so my Zeppole balls look a hot mess. I also don’t have a thermometer for this type of thing. So, I used some of the methods found on this website to determine whether or not my oil was hot enough. I had some wooden dowels laying around from a previous project so I stuck that in there and used that method. It sizzled…a lot? Enough? Not really sure-fire so I’ll buy a thermometer next grocery day. Final verdict? They were alright. I really thought I bought an orange specifically for this recipe because I really like the idea of citrus and chocolate together, so I was a little disappointed (I’d already poured the oil, too late to turn back) about that. 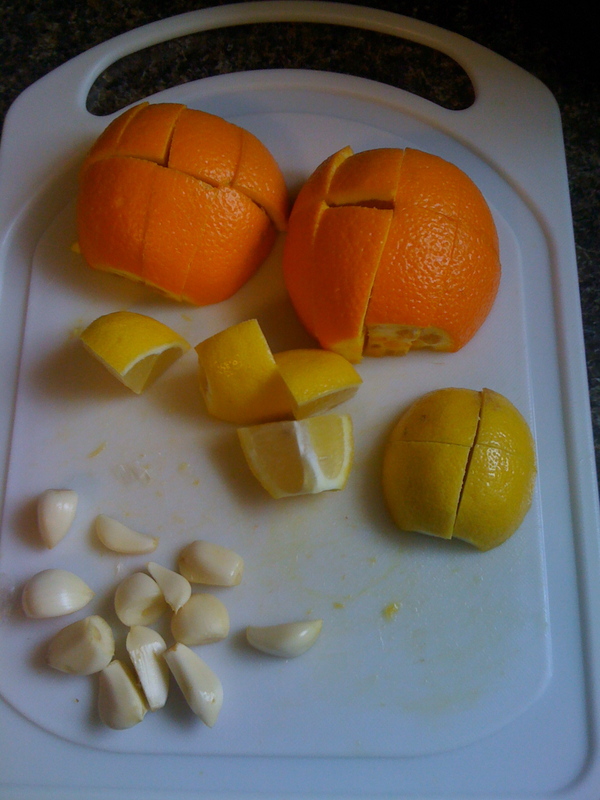 I will make them again and include the orange. I really think that would take these from ho-hum to yum yum! I just made that up, nice huh? hah :) The chocolate sauce was good, and made plenty even with my cut down mixture, so keep that in mind. 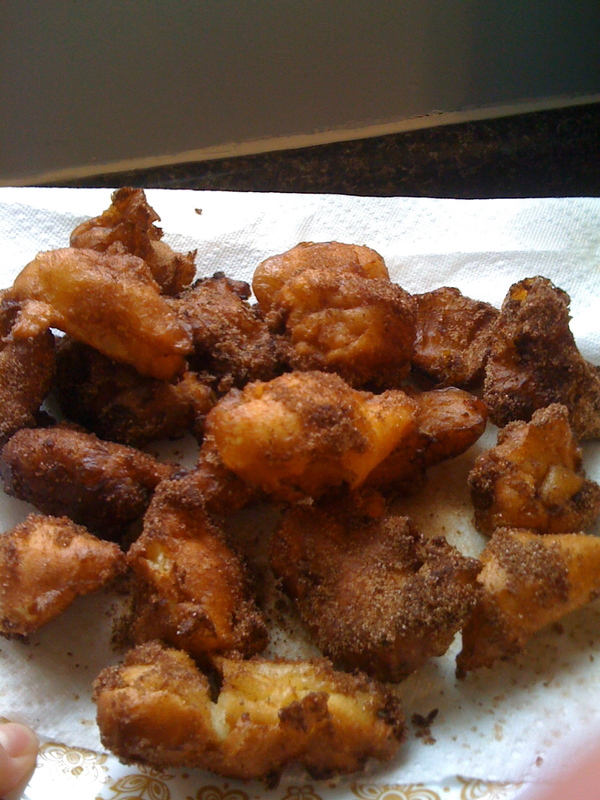 They taste like donuts and if you watch the video, Giada says they’re Italian donuts; I wasn’t aware of that beforehand or I might’ve skipped these because I’ve made homemade donuts before. But like I said, I’ll make ’em again and let you know! Oh boy, another Giada recipe! I guess I use a lot of these because daughter-bug and I watch her show every day at 12:30p as her wind down show before nap. I mean, much rather this than most cartoons, no? The original recipe can be found here. There is also a video that goes along with it. 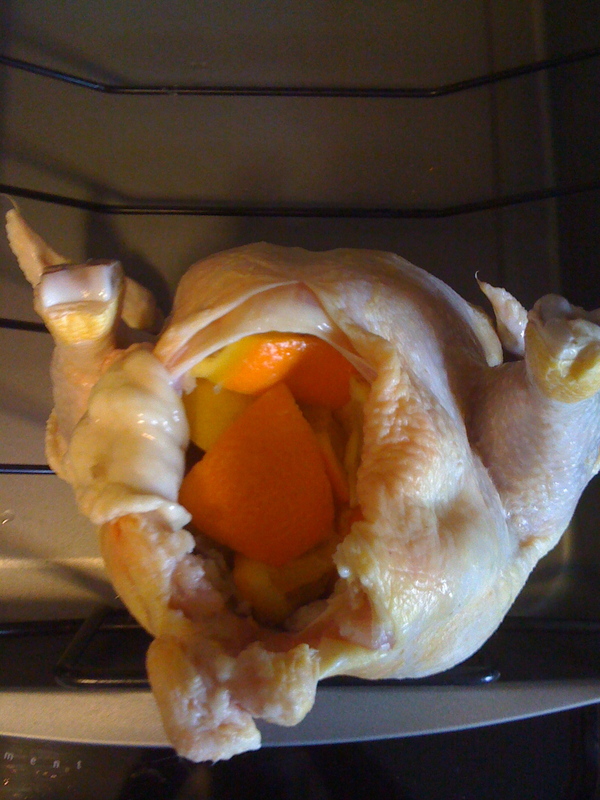 1 (5 to 6-pound) whole roasting chicken, neck and giblets discarded Note: The one’s with the thermometer that pops out when finished are the easiest, but they’re hard to find this time of year. 1/4 cup fresh lemon juice Note: Mine was not fresh! 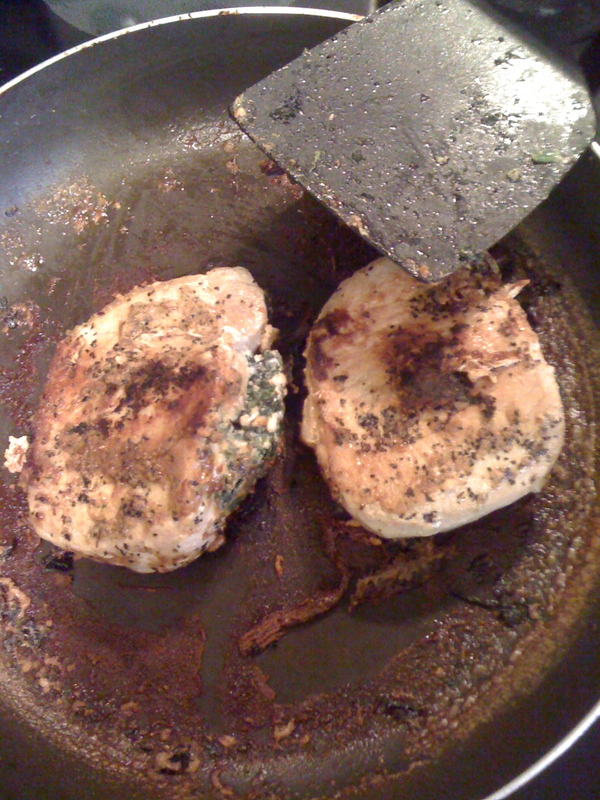 1 tablespoon chopped fresh oregano leaves Note: I never use/have fresh herbs, always dried. Kitchen string or butcher twine Note: My WalMart didnt have any. I used white string/yarn/thread stuff. Also found you could use unwaxed dental floss. Husband Rating: 6. He ate it, but that’s about it. Would I make this for someone else? No. In fact, I probably won’t make it again. It wasn’t so much that it was bad as there was nothing special about it. It turned out very moist, but I thought it was very bland; husband however, said it tasted like he was eating an orange peel lol. Eh. So so. Healthy! And with all that stuff crammed in there, I thought for sure it would be delicious, but it wasn’t :( Let me know if it turns out better for you! Let me start off by saying that I got a little behind and began dinner a little late. I was rushed and trying to do about 5,783 other things (I’m a great multi-tasker), so when you plan on making a brand new recipe, give yourself the proper time to accomplish the task! It will come out better and you will enjoy the experience more :) The full recipe can be found here. 1 tablespoon olive oil, plus 1 tablespoon. 2 cloves garlic, minced. Note: I didn’t have any so I used garlic powder instead. Not ideal, but you gotta use what you got girl! 1 (10-ounce) bag of frozen spinach, thawed and excess water squeezed out. 1/2 teaspoon salt, plus more for seasoning. 1/2 teaspoon freshly ground black pepper, plus more for seasoning. 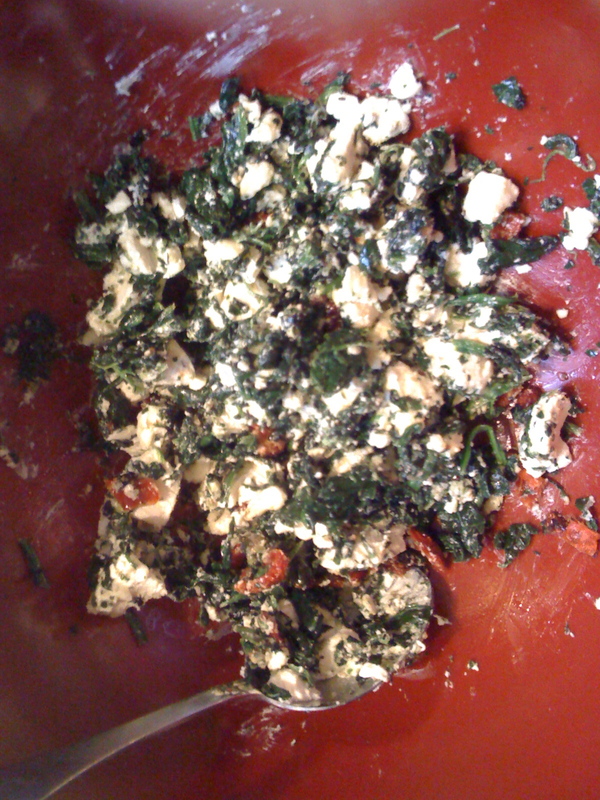 1/4 cup (2 ounces) goat cheese. Note: Out yonder (aka where I live), goat cheese is not readily available so I substituted Feta cheese and it was fantastic. 1/3 cup reduced-fat cream cheese. 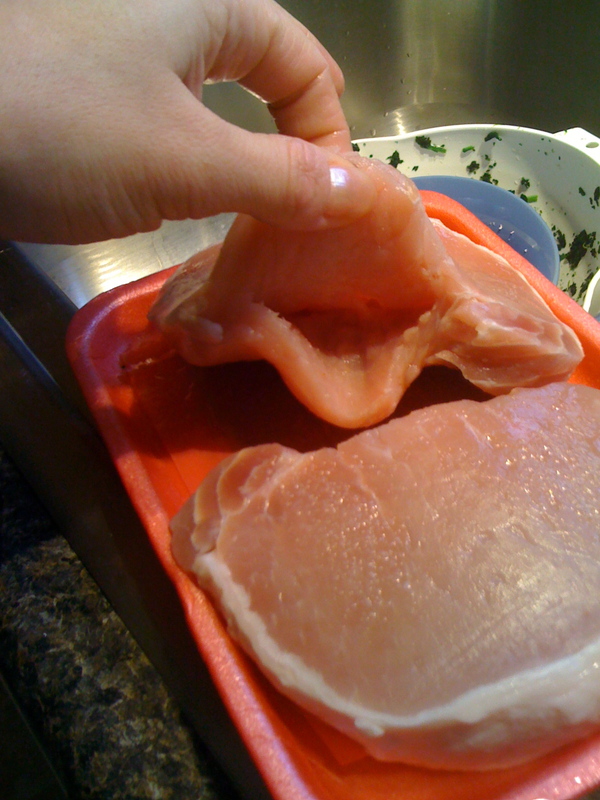 4 (4-ounce) center-cut pork chops. 1 1/2 cups chicken broth. Note: I always make my own using bouillon cubes because it’s cheaper. The way Giada lists the ‘to-do’s’ in her recipe were out of order for me. I would start out by first cutting the pocket into the pork. After completing this, I would put the sauce together, even though it’s not used until later. I’m a Type A person and like to have everything mixed, set out, chopped up, etc before actually beginning the recipe, but that’s just me :) So now that you’ve done all that, back to Giada’s way. My cream cheese wasn’t all that great; it was the rectangular kind and not all that susceptible to smushing, which presented a problem for me. Buy the soft kind or try a blender or food processor? I just review ’em, I can’t always fix ’em :) After some laborious stirring, I got it to the consistency I remember seeing on the episode. Frozen spinach is just disgusting. I’m not even gonna lie. Squeezing the water out of it was not fun, but what Giada said, I tried to do! P.S. I think the spinach smells bad too, yuck. I want so badly to like frozen and cooked spinach, but so far, not good. Cooking the cream cheese/goat (or Feta) mixture went just fine. Smells kind of scary but press on. 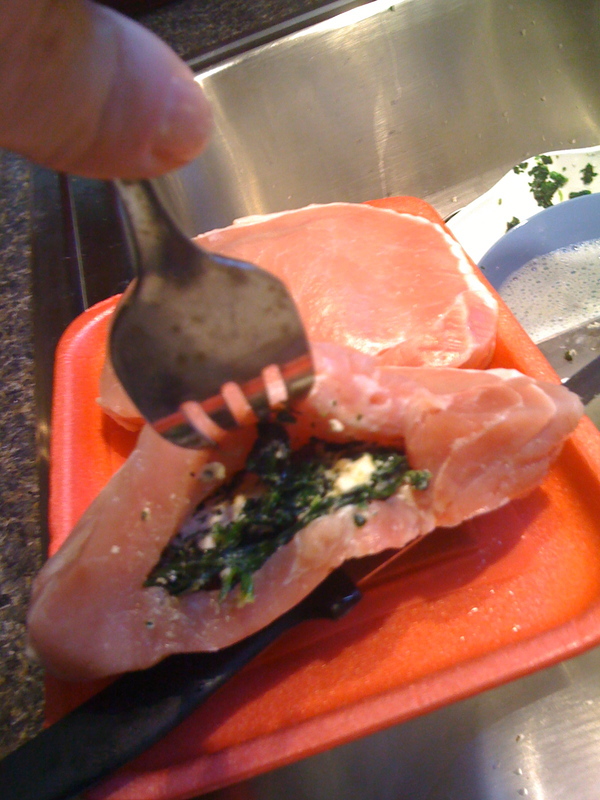 I was a little apprehensive about cutting a pocket into the pork chops and I’ve always avoided recipes that involved such a task. Why? Who knows, but it went great! I bought a two-pack instead of four because the two-pack chops looked thicker and more suited to having a pocket cut into them. Don’t cut too deep and slice your hand open. I’m very accident prone and you might be too–cut slowly. Making a reduction. Pretty sure I’ve never succeeded. I tried though, I did! I let it simmer for the recommended eight minutes and it was still very liquid-y. So I thought, what the hay, my chops aren’t done either, lets cook it all together shall we? OH! I also squirted some regular mustard into the ‘sauce’ for some reason, um, so that’s completely up to you. Not a ton, but a few squirts. Ok, back to the mess in the pan. Sauce and chops cooking together. Waiting for it to reduce. Daughter is standing on her knees on a chair ‘washing’ dishes in the sink. Next thing I know she’s tumbling off the chair–she’s totally fine, no worries. There were tears shed and a mess to be cleaned, sorry porkchops (a measuring cup full of water tumbled with her and I’m a sucker for a mess). Crisis solved, back to the stove I go, and lo and behold! My sauce has reduced…to a dried, burnt on hot mess. I was a little sad about not having a sauce, but the chops kept cooking and finally finished. So how was it?! DELCIOUS. I find it hard to make really flavorful pork for some reason. This was just insanely good. 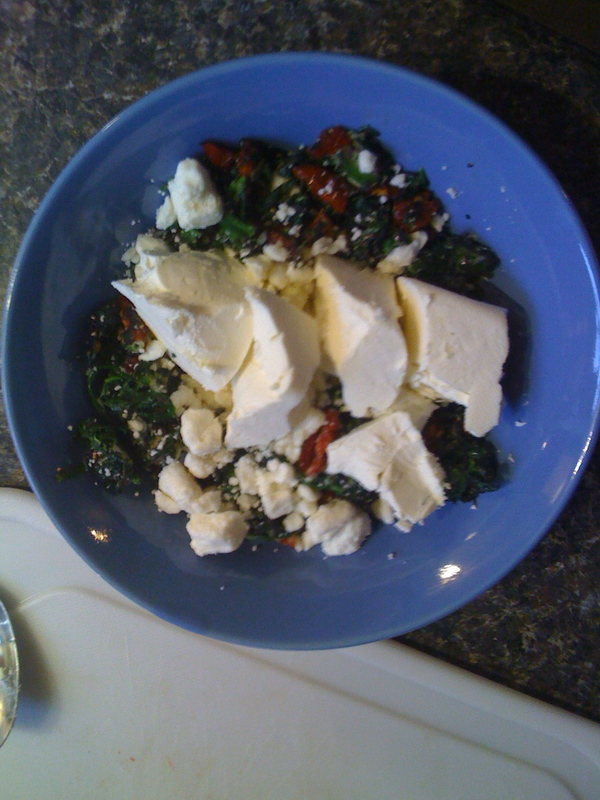 It didn’t look good, but it was flavorful and tangy from the feta and cream cheeses, moist. I gave daughter a few bites of pork and spinach mixture, looked up a few minutes later and it was gone! She didn’t like the spinach/cheese mixture alone, but with the pork she ate it up. I liked it all; seperate, together, whatever. Great. Now, husband abhors frozen spinach. In fact, the first thing he said when he finally saw it was, “Uh, you put spinach in it? 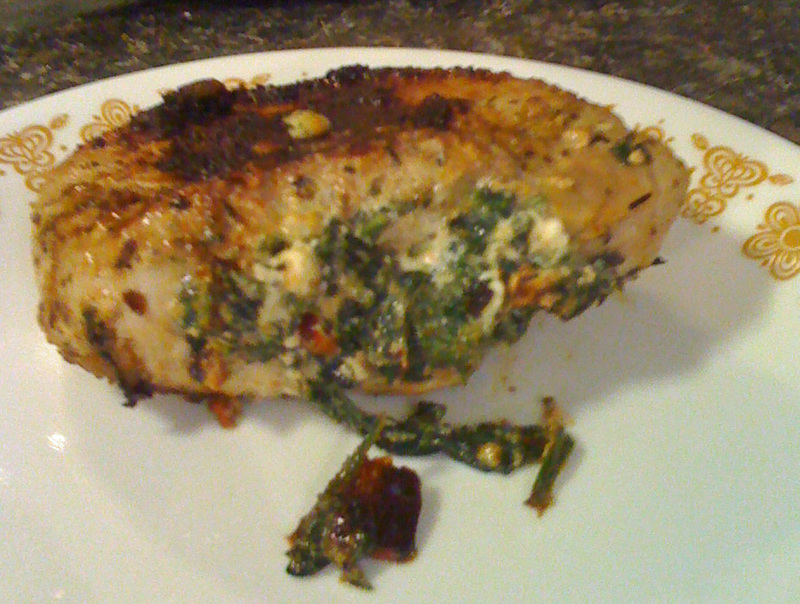 I hate cooked spinach.” But he was in class and wouldn’t get some until later, re-heated…his verdict? Would I make this for someone: Possibly. I’d want to make it again with the sauce, with plenty of time to make it. It also wasn’t that pretty? I mean, you can judge for yourself. I’d consider making this if I ever had a couple over for dinner, but no, I wouldn’t send this out to someone. Not really a traveling kind of meal.